Today is Fresh Start Day! It’s only the 6,304th Fresh Start Day of my life, lol. But one must never stop trying to better one’s life! Woke up with painful cramps and thought I wasn’t going to be able to do my morning habits, especially yoga. So much for Fresh Start Day! But, luckily, the pain subsided and I was able to get up and tick all my morning habits boxes. Yay to small victories! Started logging iron and calcium today. Haven’t found a good app that will break down my minerals intake so I’m doing it manually using Google. It is super tedious googling every single item I eat and calculating the numbers for my serving sizes, but I love filling in my new health tracker. 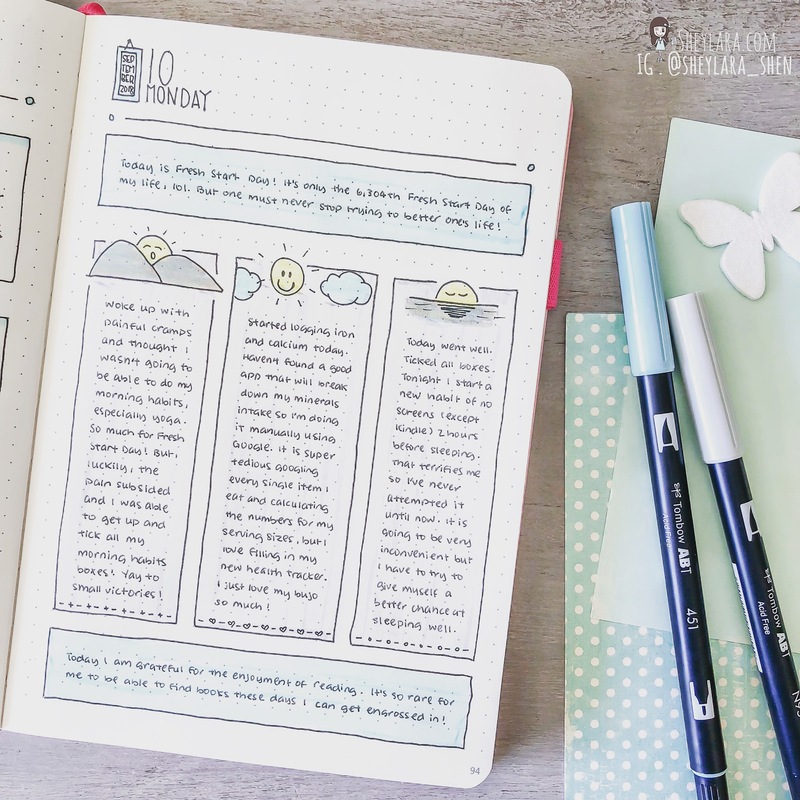 I just love my bujo so much! Today went well. Ticked all boxes. Tonight I start a new habit of no screens (except Kindle) 2 hours before sleeping. That terrifies me so I’ve never attempted it until now. It is going to be very inconvenient but I have to try to give myself a better chance at sleeping well. Today I am grateful for the enjoyment of reading. It is so rare for me to be able to find books these days I can get engrossed in!